Displacement plot for a wheel analyzed using Schillinger’s isogeometric method. Image from Schillinger’s paper. Research on isogeometric analysis won the 6th John Argyris Award for best paper by a young researcher at the 10th World Congress on Computational Mechanics. Dominik Schillinger, who conducted his research at the Institute for Computational Engineering and Sciences (ICES) at the University of Texas at Austin, won for his paper titled An Isogeometric Design-through-analysis Methodology based on Adaptive Hierarchical Refinement of NURBS, Immersed Boundary Methods, and T-spline CAD Surfaces. Cobalt Solutions, developers of the Cobalt CFD code, issued a news release backed up by a technical paper in which they cite high scalability of their CFD solver on tens of thousands of processors with similar potential for hundreds of thousands of processors. The paper, Can Legacy Codes Scale on Tens of Thousands of PEs or Do We Need to Reinvent the Wheel?, includes data showing Cobalt’s super-linear scalability all the way up to 21,856 PEs (processing elements) for a grid of 49 million cells. 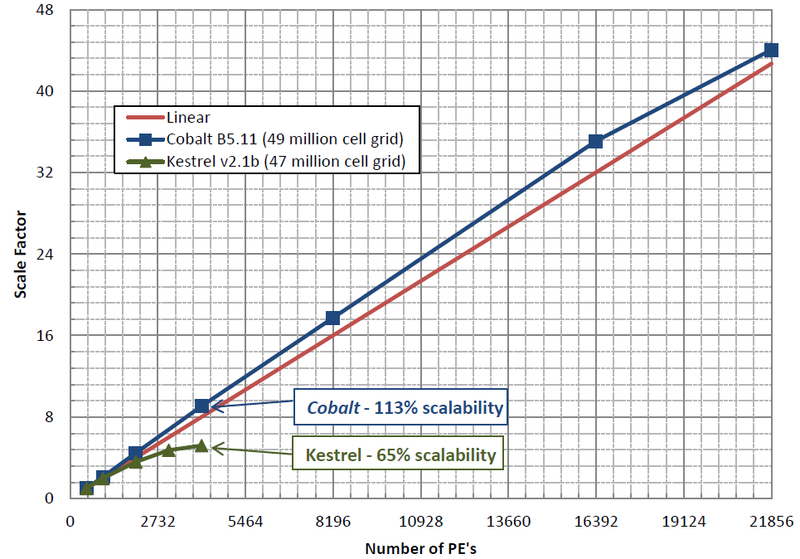 In this image from the Cobalt Solutions paper, Cobalt CFD is shown to have super-linear scalability relative to Kestrel. Mentor Graphics announced the upcoming availability of a new 1D-3D CFD simulation software suite based on their FloEFD and Flowmaster products, the latter recently acquired. iRhino 1.3 is now available for geometry viewing on iOS devices. CFD pioneer Prof. George Raithby of the University of Waterloo is profiled in this article from ANSYS. Azore Technologies introduced Azore Light, an introductory version of the Azore CFD Suite. The light version is limited to 2D problems and 32-bit architectures. Flow Science announced a collaborative effort with Silicon Mechanics to deliver a turnkey cluster solution for running FLOW-3D/MP. Symscape provides a preview of porous media capability coming in Caedium v4. Symscape also shares a link to a CFD study of an exercise bike for astronauts on the International Space Station. I am a terrible photographer and beyond help. 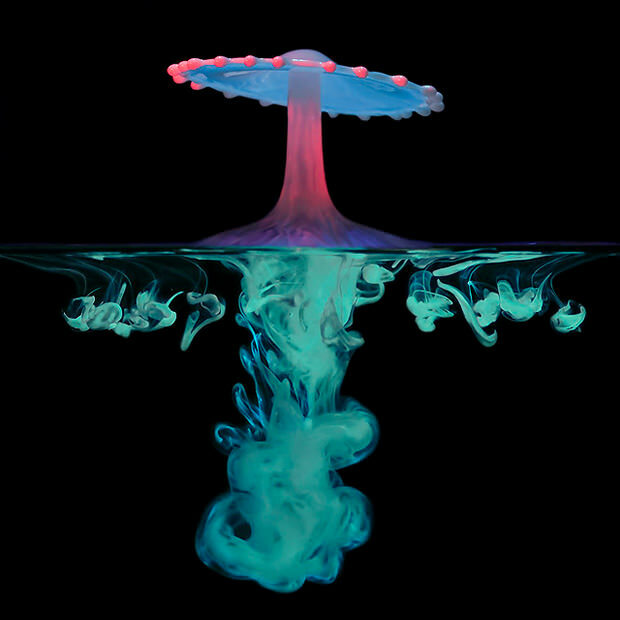 But others of you may benefit from this article on How to Shoot Liquid Flow Photographs. 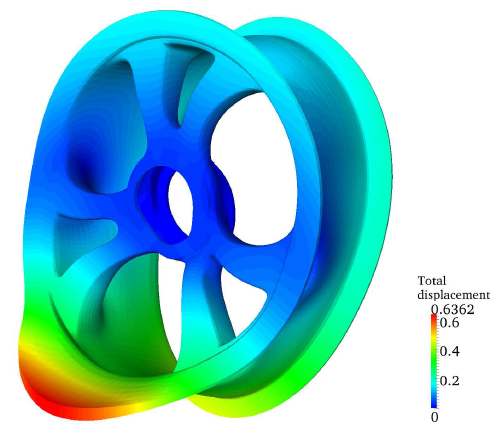 This entry was posted in Applications, Hardware, News, People & Places, Software and tagged ANSYS, Azore, Caedium, FloEFD, Flow Science, FLOW-3D, Mentor Graphics, Rhino, Symscape. Bookmark the permalink. I really enjoyed the book by professor Hughes et. al (http://amzn.com/0470748737). I have been planning to write a small Isogeometric c++ program since I read the book, I need to learn more about nurbs. But, John, you are correct, where is the fun if meshing is not involved??? Cesar: NURBS are fun too. I learned by starting with Mortenson’s book, then Farin, and Piegl & Tiller. I’m planning to buy the The NURBS Book (http://amzn.com/3540615458). I have a list about 15 books in my wishlist, topics goes from optimization, NURBS, C++,C##, SQL, git, etc… all the topics I think I need to create a simple yet robust CAE related program. Thanks for the recomendation!